Dubai, 15 January, 2019: King’s College Hospital London in Dubai has opened its doors, both for outpatients and inpatients. The impressive 100-bed facility has already welcomed numerous patients and begun surgical operations, including general surgery and paediatric orthopaedic cases. 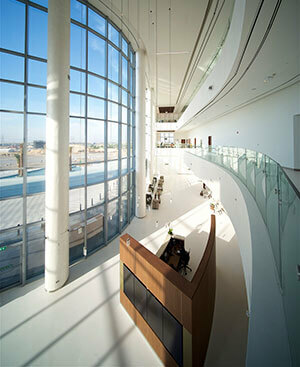 Located at the heart of Dubai Hills, the hospital cost 200-million-dollars and took one-and-a-half years to build. King’s College Hospital London has been brought to Dubai through a joint venture with Al Tayer Group, Dubai Investments and the UK-based Ashmore Group. The newly-opened hospital will act as the central direct link to King’s College Hospital in London, a world-class teaching hospital based in the United Kingdom. The London-based hospital has a 175-year history of caring for patients with complex conditions and is one of the largest teaching hospitals in the UK. The Trust’s 11,000 staff treats over one million patients every year, and annually over 9,500 children are born in its maternity wards. The London and Dubai hospitals will share knowledge from established King’s research centres in the UK. Utilising King’s College Hospital’s world-leading expertise in healthcare will ensure the very best care is delivered at patients’ bedsides in the UAE, ensure further collaborations between UAE-based clinicians and UK-based physicians, and most importantly ensure seamless patient journeys between the Dubai and London hospitals. This means that world-leading care, including several highly specialised tertiary care procedures, such as fetal surgeries, where babies are operated on while still in their mother’s womb or procedures that reverse some forms of type 2 diabetes, will be made available at the hospital in Dubai through a visiting Faculty programme from King’s College Hospital in London. This programme provides access to some of the world’s best clinicians from the UK by providing excellent patient-care and treatment. The visiting faculty will be in the UAE regularly to see patients during their pre- and post-operative care at all of King’s UAE facilities. Upcoming visiting faculty includes, Associate Professor Bu Hayee, Consultant Gastroenterologist who specialises in pioneering endoscopic procedures to treat metabolic disease which causes high blood pressure, high blood sugar levels and obesity, bowel cancer screening, treatment of achalasia and gastroparesis, amongst other lifechanging procedures. Currently, over 70% of the employed clinical staff at King’s UAE are UK trained. King’s ‘Getwell Network’. Unique to King’s, the hospital is equipped with an edutainment system offering patients not only entertainment, but up-to-date, interactive information and education about their condition at the touch of their fingertips. For example, a patient undergoing surgery can learn everything relating to their procedure, condition management and what to expect during the recovery period through interactive media that is adapted specifically to the patient. Whilst all this information is explained by the doctor in person, patients benefit from having a one-stop-shop portal to access from hospital or remotely from home at any time. This network also gives patients access to their medical information at King’s. With increasing protection laws worldwide, this network provides patients with the convenience of accessing their medical records in a secure, protected and private manner. EOS imaging system. King’s is the only facility in the UAE to have this. It is an advanced orthopaedic imaging technology that gives doctors a clear 3D view of the patient’s musculoskeletal system and helps them make life-changing decisions regarding the patient’s treatment. This replaces the need to take four to six X-rays, as it automatically stitches the scans together and boasts much greater accuracy than currently used methods. It only exposes patients to 10% of the radiation normally required and has a micro radiation dose option making it highly effective for paediatric orthopaedics. Pharmacy-led Omnicell® End-to-end automated medication management process. This automated dispensing technology combined with Cerner® barcode medication administration and electronic prescribing ensures medication management is optimised to a safe, fully traceable, paperless system at the point of care and clear visibility of patient therapy management. King’s is also the first facility to have an automated medication management solution in the operating theatres, contributing towards patient safety. King’s in the UAE will specialise in five core areas – Paediatrics, Cardiology, Orthopaedics, Obstetrics and Gynaecology, and Metabolic Diseases, as well as offer integrated pathways with King’s in London in Chronic Liver disease, Foetal Medicine, Haematology as well as several other areas. The hospital also provides acute and general care services in Anaesthesia and Intensive Care, Emergency Department, Cardiology, Endocrinology, ENT, Family Medicine, Foetal Medicine and Neonatology, Gastroenterology, General Surgery, Vascular Surgery, Paediatric Surgery, Breast, Thyroid and Colorectal surgery, Aesthetic and Reconstructive Surgery, Radiology, Urology and Neurology. The hospital brings the King’s UAE footprint to a total of four facilities in the UAE; the other three include Medical Centres based in Jumeirah and Dubai Marina, in addition to a Medical and Surgical Centre in Abu Dhabi. Each facility is fully integrated, 365 days a year, with King’s in London. 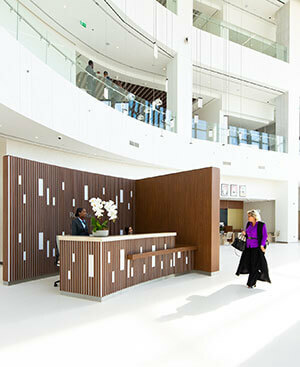 King’s plans to further grow its UAE footprint by adding 100 beds to the hospital as part of a phase two expansion. The hospital, including the other King’s facilities, will accept most insurance providers.